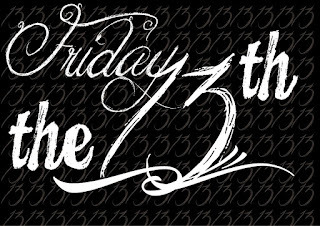 Paraskevidekatriaphobia or Friggatriskaidekaphobia is the official name for the phobia of Friday 13th. 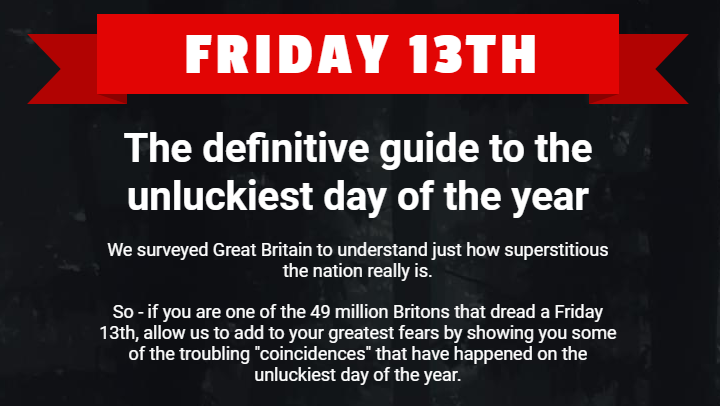 Fears surrounding the superstition are also surprisingly common, in fact new data reveals that 49 million Brits dread the date. 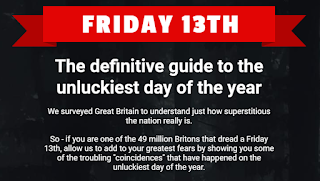 The history and origins of Friday 13th fears are widely debated, however, two examples are consistently referenced. The first, is that Jesus Christ was crucified on a Friday and Judas Iscariot who betrayed Jesus was the 13th guest at the Last Supper. The second event, dates back to 1307 when King Philip IV of France commanded for hundreds of members of the Knights Templar to be arrested, they were then tortured and burned alive! In the modern day, superstitious people believe that Friday 13th brings bad luck to employment, finances and even love. 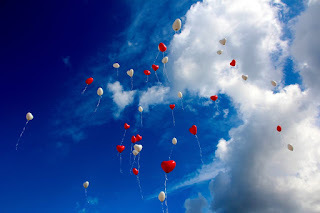 Dating and relationships can be affected which is proved by the many celebrity breakups. Michael Chopra and Heather Swan married on Friday 13th and argued throughout their honeymoon splitting only a few weeks later. The devastation of divorce has also occurred on the unluckiest day of the year wreaking havoc on celebrity relationships. After ten years of marriage, Bill Murray and Jennifer Butler finalised their divorce on Friday 13th. Johnny Depp and Amber Heard’s marriage also ended on a Friday 13th after months of arguments. So, with cases like these is it any wonder that we don’t want to tempt fate with our love lives? So if the thought of Friday 13th makes you tremble, we’d recommend you hole up inside with a cup of tea and some biscuits...day off anyone? If you prefer a risk free Friday 13th, why not book the day off and hole up inside with your loved ones?